In order to repair and save a severely decayed or infected tooth, root canal treatment may become necessary. 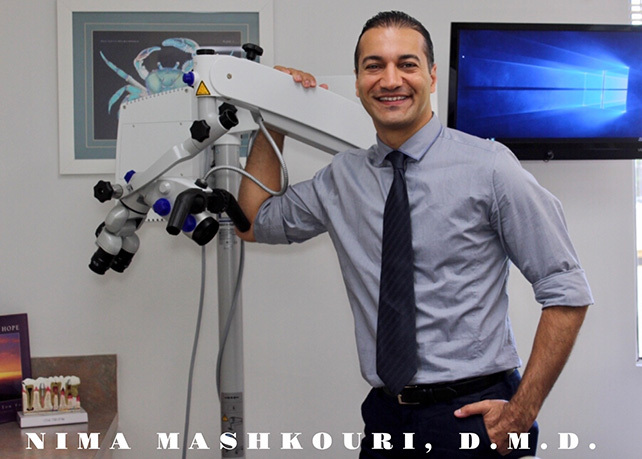 Dr. Mashkouri uses state of the art, latest technology that makes the root canal treatment go faster, more efficient and more comfortable for patients. Why are root canals performed? What purpose do they serve? Root canals are performed in order to save as much of your tooth as possible. The pulp is a very soft area in the middle of the tooth that houses all a tooth’s nerves and roots. Nerves can be removed because they are not necessary for normal biting and chewing function. "With my good friend and favorite gadget Zeiss. In Endodontics with the help of microscope, its advanced lighting system made of LED, optical efficiency and high quality imagery, we can find longitudinal fractures, additional and calcified canals and canal entrances covered by tartar. We can diagnose and treat perforations more efficiently, remove separated instruments from canal, retreat canals by removing old seal with special ultrasonic instruments and overall have more predictable results." When is root canal required? Root canals are required when the pulp part of a tooth has become severely decayed in infected. The most common cause of this is failing to brush and floss the teeth as part of routine oral maintenance. Cavities that are not treated in time often will lead to having a root canal. If decay continues to be neglected, then tooth extraction is the only option. What to expect during a root canal? Dr. Nima Mashkouri uses advanced technology in his office that allows the entire procedure to be completed swiftly and without pain. After anesthesia is provided to numb the site from pain, Dr. Mashkouri will then carefully remove both the pulp and the nerves from the infected or decayed tooth. He will then seal the tooth off with a special rubber compound and leave you with post op care instructions for a smooth & successful recovery. Most root canals take no longer than 1 hour from start to finish. Because a portion of the tooth is lost during the procedure, it is necessary to receive a dental crown in order to restore your tooth to full, working function. In an Emergency? Contact Paradise Dental Today! Most often, root canals are an emergency because of severe pain that has resulted due to neglecting a cavity or an accident has occurred. If you’re in pain that is not responding to over-the-counter medication, then please pick up your phone and call our Santa Monica dentist to schedule you in as early as possible. Includes limited x-ray and exam. Are you experiencing pain or discomfort? Schedule an immediate visit in order to treat the pain. *New Patients only. Must be presented at initial appointment. Cannot be combined with any other offer. One coupon per person. "My appointment was with Dr. Mashkouri & he saw me right on time. He greeted me with a smile, gave me great advice, was gentle, and did everything he could to make me comfortable. "